I can’t say the old Oxford Tavern is a place I ever visited. 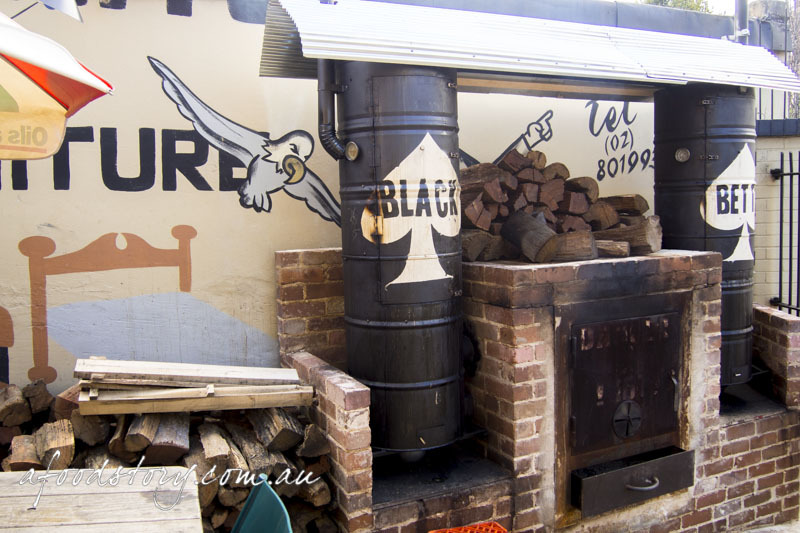 But the new digs is somewhere I’ve wanted to suss out for a while, especially since Jamie Thomas installed ‘Black Betty’ the smoker. A catch up with friends was the perfect excuse for a Sunday sesh. 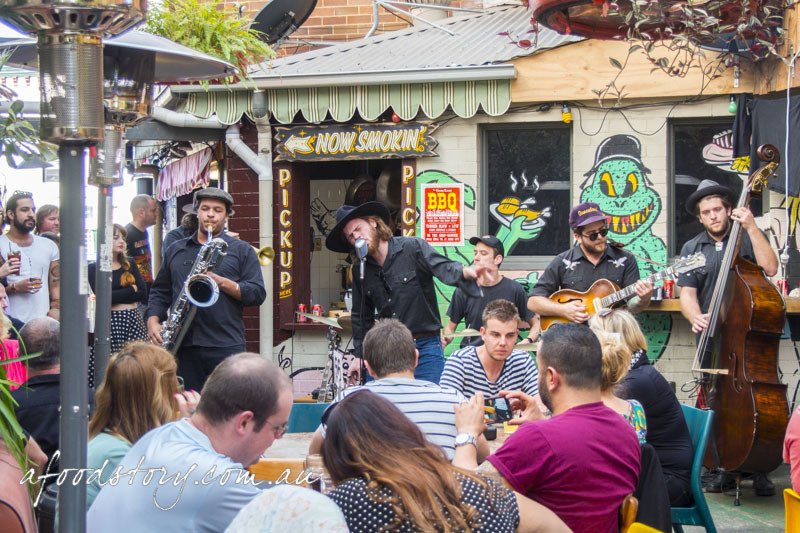 And what better way to spend a Sunday sesh than in a sunny courtyard with smoked meats, beers and a band?! Arriving just before noon we were greeted by locked doors. The Oxford Tavern doesn’t open until midday on Sundays and we were early. I spotted Josh from Cafe Ish out front while we waited, he was clearly keen too. It didn’t take long for a crowd to gather and by the time the doors opened there were people everywhere. Shortly after that the place was packed. Having dined at Papi Chulo earlier in the week it was going to be an interesting one. 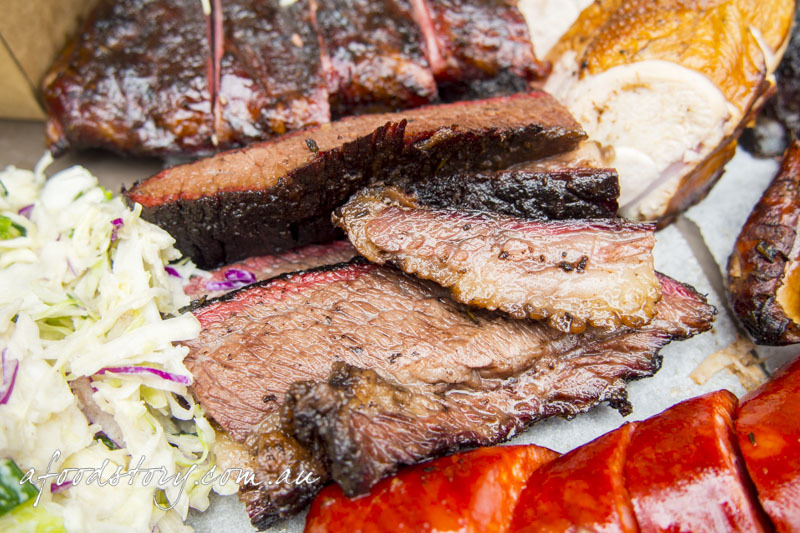 I know each place does their own thing but at the end of the day they’re both smokehouses to some extent (Papi Chulo is a smokehouse and The Oxford Tavern has a smoker out back but has a rather extensive menu totally separate from the smoker). It’s difficult not to compare the two, especially when having eaten at both in such a short period of time. Not knowing where to start I grabbed a piece of the smoked pork snag. 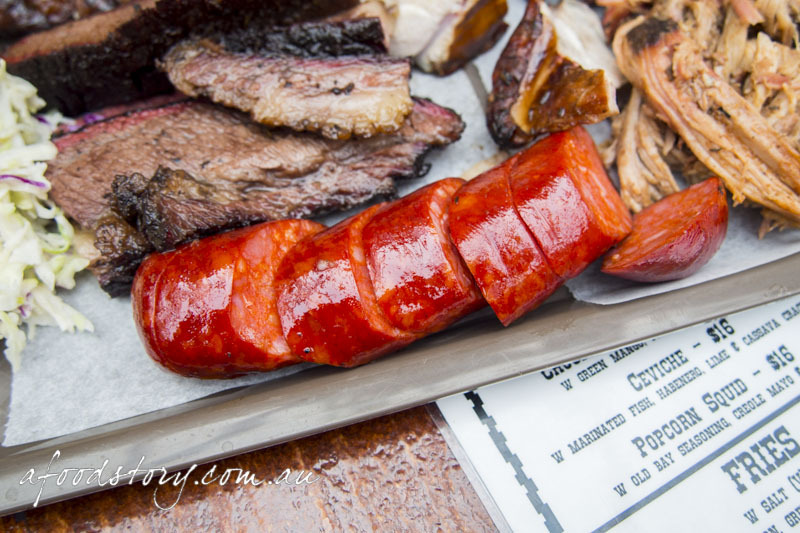 It was something that was not quite chorizo and not kransky, but a smoked pork sausage that brought the best of both worlds to the party. Smoked well and full of flavour, it was heavy on the paprika and garlic without ever being too much to handle. A world class snag that would hold its own against much of the competition. 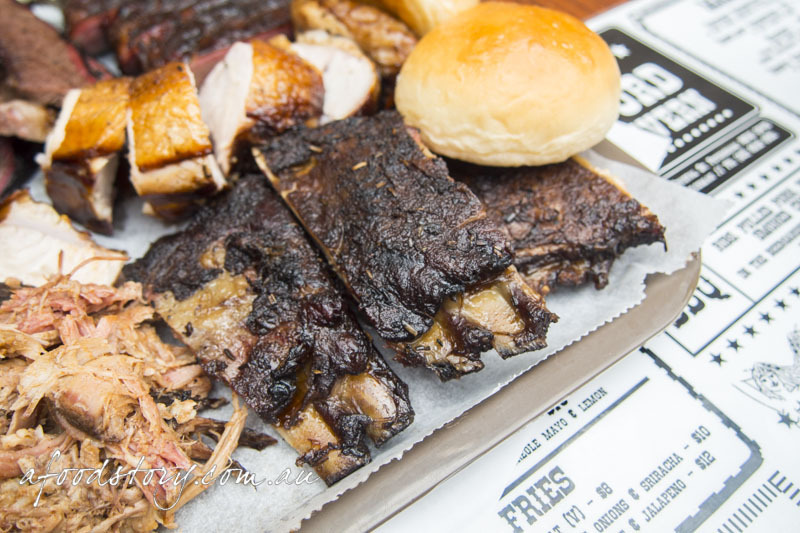 Pork ribs with honey Jack Daniels, black treacle and American mustard ($7.00 per 100g). Next up was the special of the day, pork ribs marinaded in honey Jack Daniels, black treacle and American mustard. With a glossy sheen from the marinade and the smoking process leaving a vibrant pink hue they looked enticing. The pork ribs were well seasoned and a great flavour combination with a slight tang and beautiful sweetness from the black treacle. 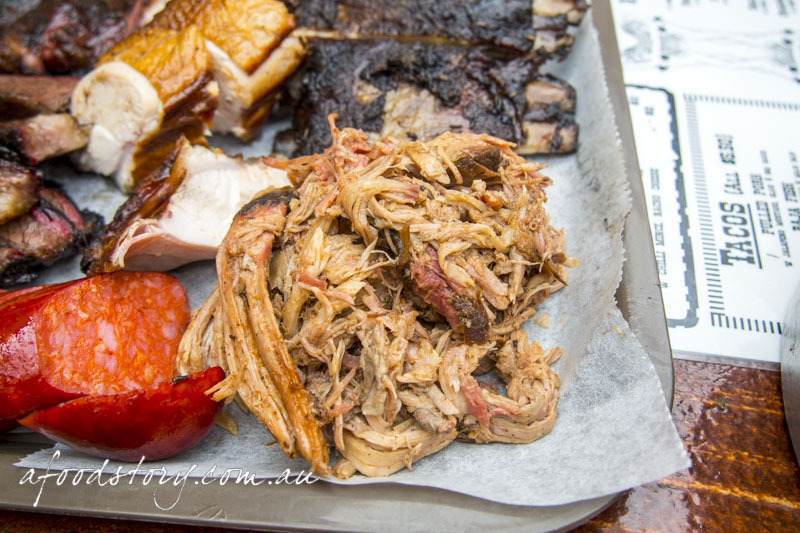 This was just the start of a messy affair as there was no leaving meat on these little babies, everyone in sight was gnawing away at the bones. Lamb ribs ($6.00 per 100g). Continuing on with the rib theme I dove in to the lamb ribs. These beauties blew me away with their juicy, succulent meat that simply oozed flavour. Lamb fat is one of those things that for me absolutely has to be super hot and super tasty or I just can’t eat it. There was no need to worry about that here though as these lamb ribs were cooked so damn nicely the fat just melted in the mouth. Incredible. Taking a slight detour from the heavier meats I decided to go for the chicken next which had been fairly low on my agenda. Well, the chicken sure as hell surprised me. 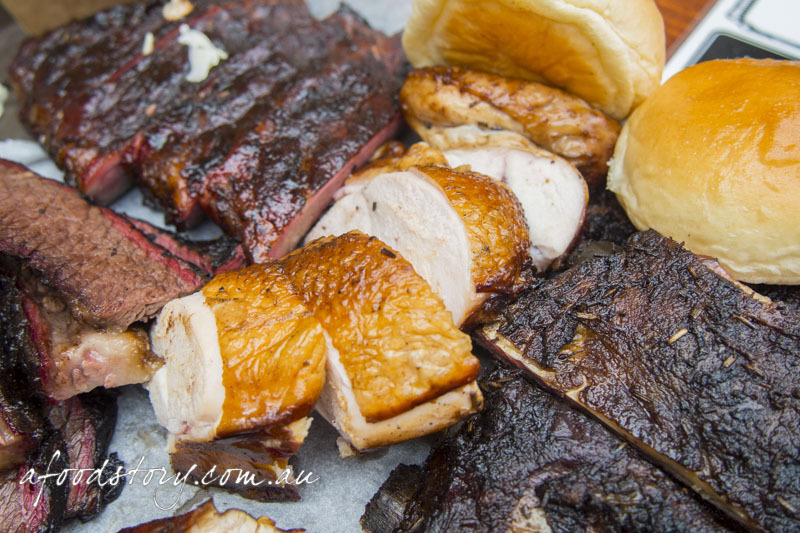 The pure genius of a smoker is that it can take the most overused protein in Australian households and make it ooze flavour. Case in point, the amazing chook that was on offer. 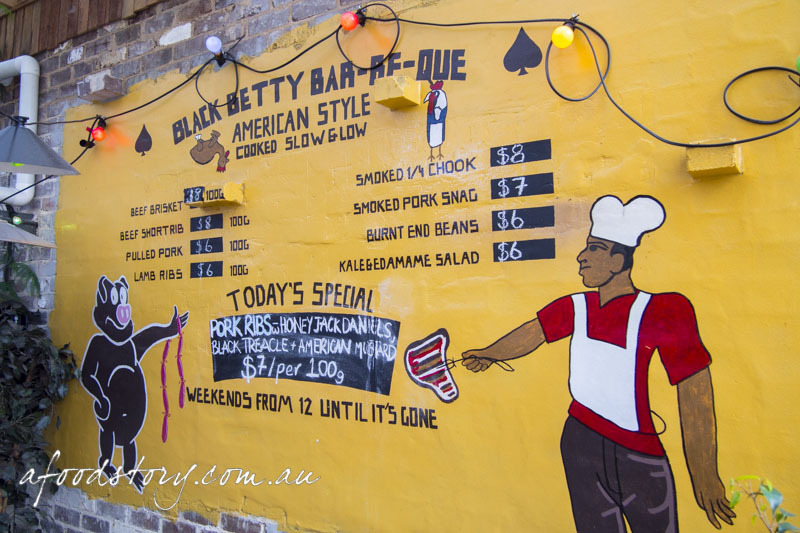 It is hard to explain how much depth Black Betty added to the humble chicken. BBQ chickens have come a long way over the years but this was next level. Beef brisket ($8.00 per 100g). Heading into the home straight I was into the beef brisket. 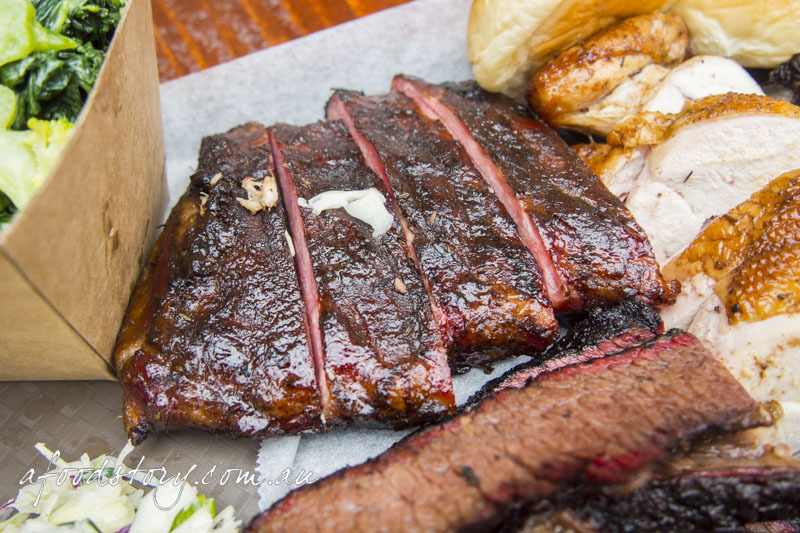 I’ve had a lot of poor renditions of beef brisket in my time and have been searching for something to fill the beef brisket hole in my heart that Mable’s Smokehouse created when I couldn’t stay in New York and forever devour their smoked meats. Could this be it? Well, Jamie Thomas sure is the master. 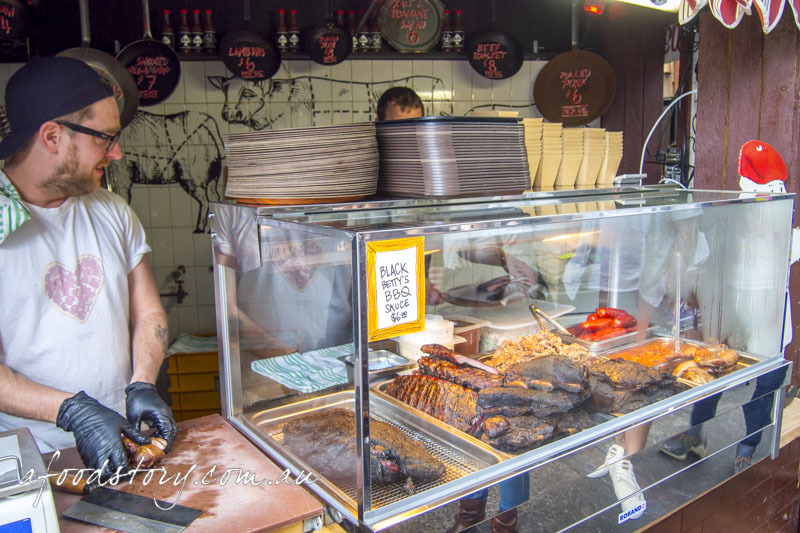 With its indelible ‘smoke ring’ the beef brisket looked stellar and hit the spot on the smoky factor, had a wonderful texture, was juicy and meltingly tender. Pulled pork ($6.00 per 100g). While licking my lips after the brisket I couldn’t forget the pulled pork. I saved the bread roll to pack full of pork as that is always an epic combo. Long strands of pulled pork were tender, luscious and delicious. Yet while it was a fantastic pulled pork, for me this was the one area Papi Chulo won over The Oxford, with their pulled pork leading the pack in the flavour stakes. Kale and edamame salad ($6.00). To balance out all that meat we had a little coleslaw and kale salad on the side. I avoided the coleslaw as Dylan dubbed it not Lex-friendly (though he rated it highly) and dove in to the greens. Broccoli, kale and beans brought some freshness, lightness and crunch to the otherwise protein packed meal. 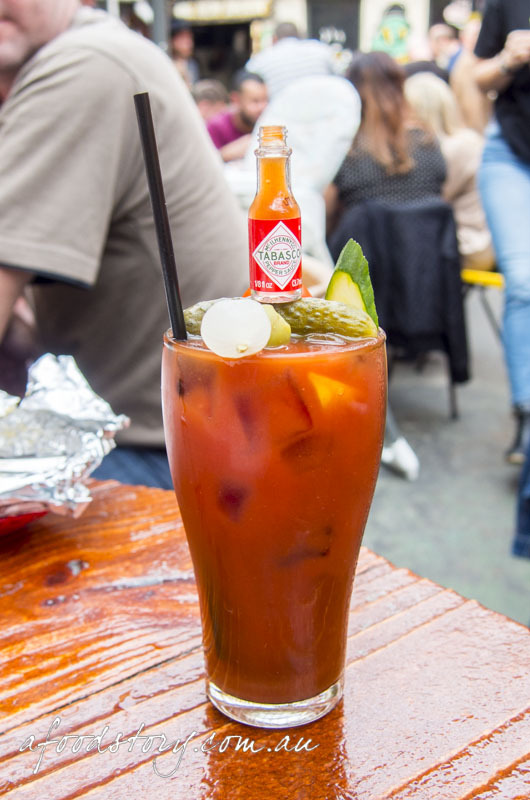 A Bloody Mary or three washed the lot down beautifully. Now after all that meat you might think we were done and dusted. Don’t be silly. 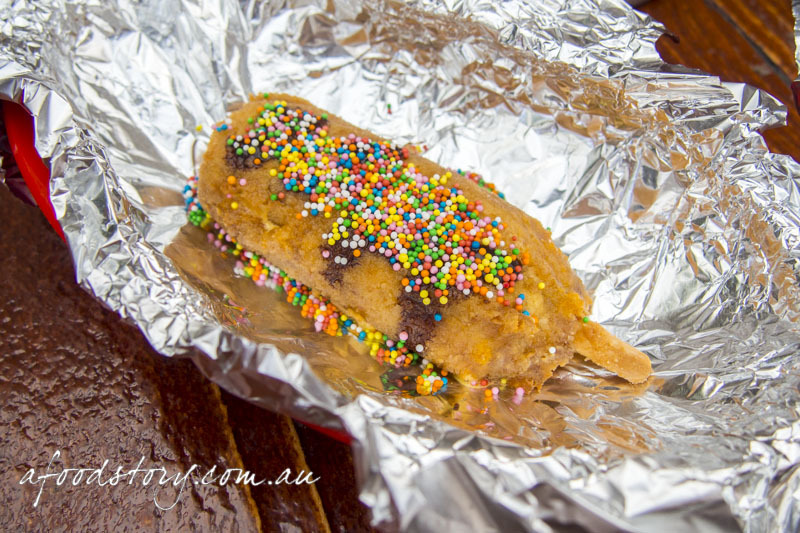 There was a deep fried Gaytime to be had. I can’t say ‘The Jelly Wrestle’ dessert spiked any interest but there were a few of us keen to see just what a deep fried 60s ice cream classic would be like. A bit of fun, yes. Better than the original? No. The Oxford’s courtyard is a great spot to sit back and enjoy a few drinks. Throw the likes of Papa Pilko And The Binrats into the mix and you’re in for an absolutely cracking afternoon. 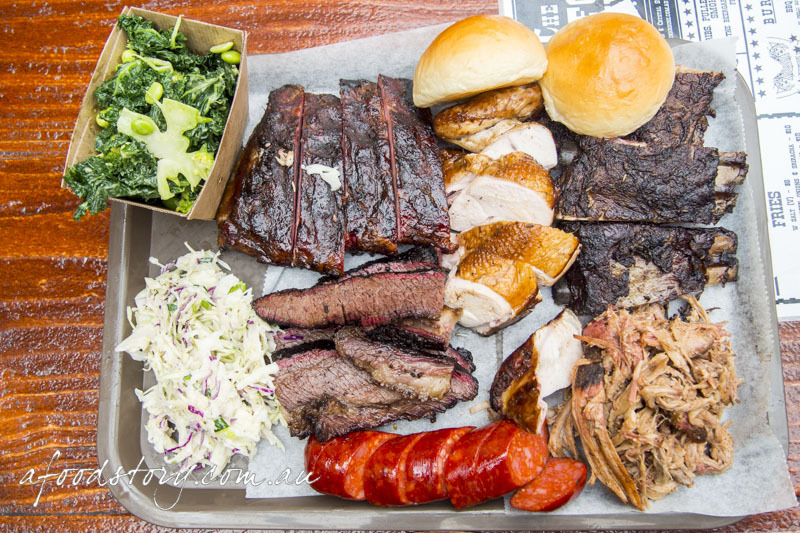 As for the smokehouse comparison, they are each awesome in their own right and I’d happily eat at both any day of the week. But on this occasion it was The Oxford for all things smoky and Papi Chulo for all the non-smoky dishes. The Carrington may be gone but I’m glad Jamie’s got his new thing at The Oxford. The man knows food and the Drink n Dine group know pubs. Together they make an amazing team. Let’s hope they replace The Carrington with another classic in its midst. oh man how amazing is the brisket!